Today has been one of those satisfying days when I feel grateful to be a tired mummy of two little monkeys. It is often the exhausted days after a foray into London when I feel most fulfilled and Culturebaby has been happiest - I need to remind myself when I'm scanning the step-free tube map with trepidation that it really is very much worth the effort of treking into zone one with the trusty behemoth pram. 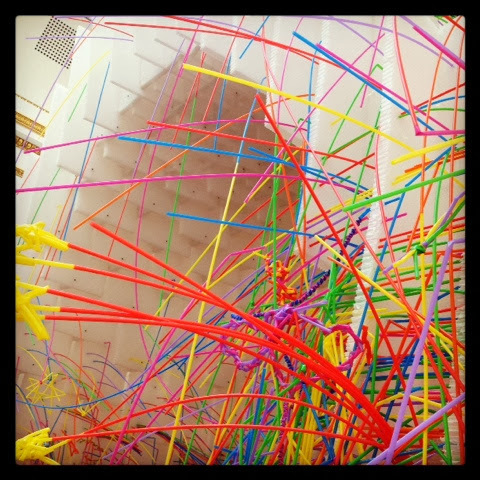 Today the Culturebabies invited two of their friends for a trip to the Royal Academy's wonderful Sensing Spaces. 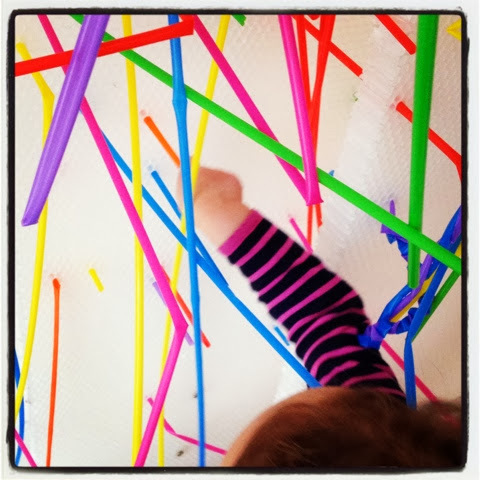 Whilst researching the exhibitions available at present I stumbled upon images of people posting straws through walls and clambering on structures and thought 'ah ha; that's the exhibition for my energetic tot'. Nothing could have prepared us, however, for quite how perfect this enchanted architecture would be for our little rabble. 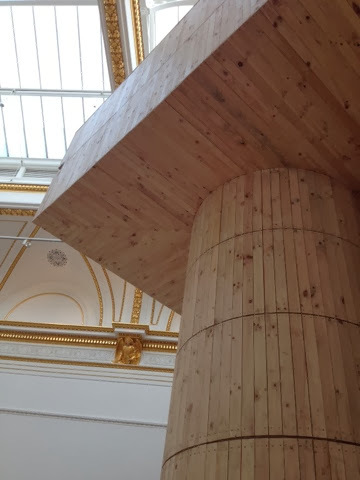 The Royal Academy invited seven architectural practices from around the world to create a series of large installations. Their brief was to present a new perspective on architecture and invite the participant (we were certainly not just viewers) to "respond to the range of structures, textures, lighting, scents and colours, and consider some of the big questions about the nature of architecture. How do spaces make us feel? What does architecture do for our lives?" Maria Montessori believed that the child under six has a capacity for taking in the whole of their environment by just existing within it - like a sponge soaking up moisture from its surroundings using all of their five senses. 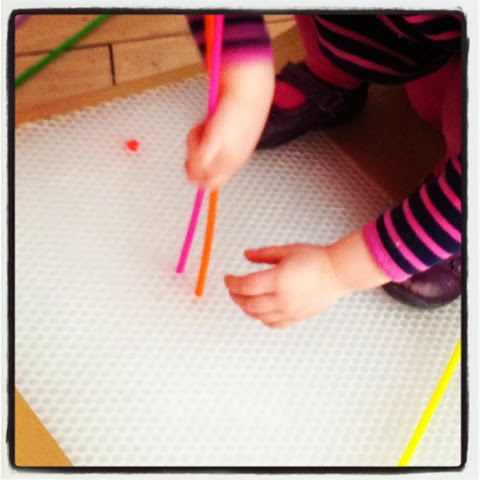 These 'absorbent minds' are essentially sensorial explorers well before they focus on social exploration. This is particularly important before the age of three. Concrete materials are essential for this learning, and these should be based in reality. Lillard and Jessen in Montessori from the Start note that "the richness of a child's later imagination depends on the depth and extent of sensorial impressions in the earliest years." This exhibition with its range of natural and synthetic materials ranging from wood and stone to metal and plastic, with light and dark spaces and illuminated elements was a ready-made sensorial learning environment that was utterly enjoyable to explore. The Academy's large scale invitation to play - and this is exactly what it was - encouraged us to "touch, climb, walk, talk, sit, contemplate - reimagine the world around you". The architects were apparently chosen because in their work they "engage with how architecture might move beyond the practical and functional and address the human spirit." It was certainly good for ours. Our journey of discovery took us through a number of interactive spaces created within the traditional galleries of the RA. Entering through Eduardo Souto de Moura's surreal arch, we were plunged, Alice-like through a spatial boundary into a wonderland of colour. 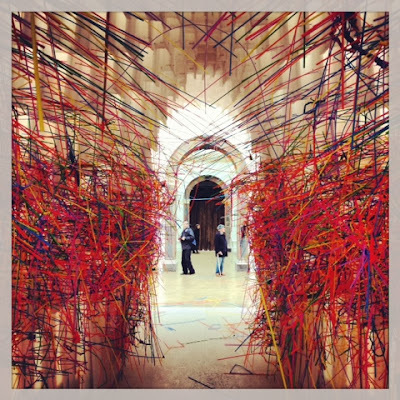 As soon as the toddlers saw Diébédo Francis Kéré's white tunnel, with its honeycomb structure and protruding technicolour array of straws, they immediately set to work helping themselves to materials and adding to the artwork. They seemed to know exactly what to do and spent a long time investigating the walls, adding elements, removing them, clambering on the 'furniture' and happily running backwards and forwards with straws. It was utterly refreshing to see the encouraging faces of other gallery goers as they commented on the joy of the children, several remarking that they were indeed the perfect appreciators for this work. 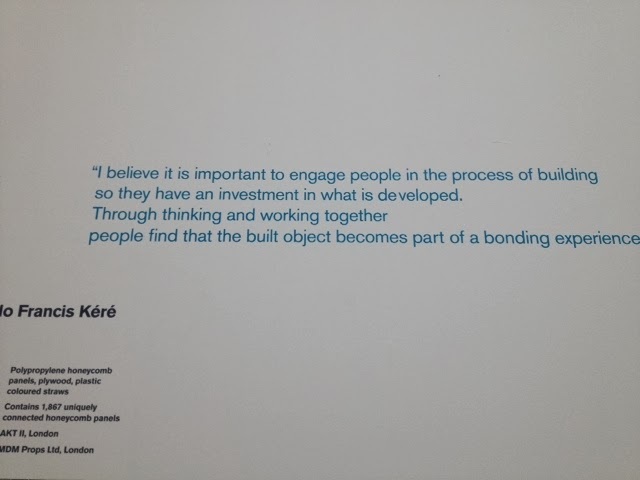 Kéré wrote that it is "important for people to engage with the process of building so they have an investment in what is developed. 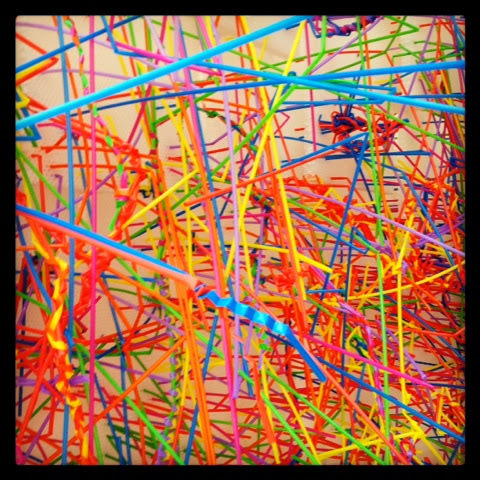 Through thinking and working together people find that the object becomes part of a bonding experience". We certainly observed this at work in this stimulating gallery. 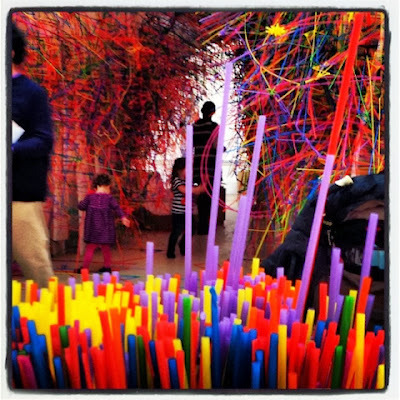 Inevitably with a two year old, there was a fraught moment when Culturebaby wanted a particular straw (which she could no longer locate) in a specific colour and context. Tears ensued when Mummy failed to solve the problem satisfactorily, but happily she was swiftly distracted within seconds with the gift of a new orange straw by a benevolent passer-by. This (despite the thousands already around us) was clearly special, and the play continued. Such are the joys and trials of toddlerhood. 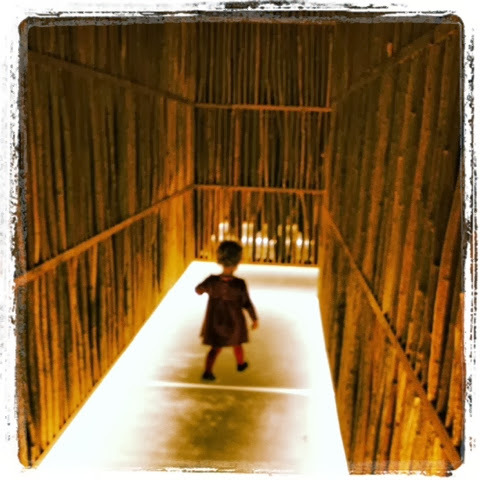 We probably could have spent the entire time in this area, but a giant wooden structure with fresh possibilities caught a little eye peering through the next doorway and swiftly led to a stampede of tiny feet. Spiral staircases led to a platform and, those toddler favoured structures, big ramps, facilitated an exciting descent. Pezo von Ellrichshausen's megalithic structure was, from a distance rather awe inspiring; reminiscent of a burial chamber supported on vertical standing stones or perhaps an Egyptian temple. Its internal spaces, however, were beautifully created and intimate. 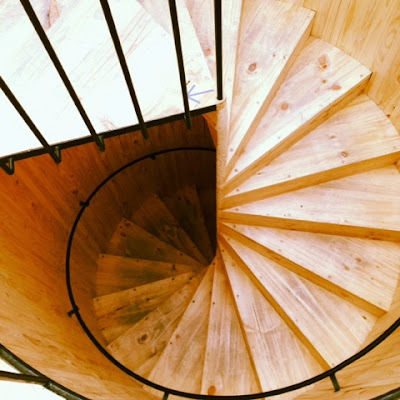 The toddlers quickly discovered that they were not only allowed but encouraged to scale the tree trunk-like spiral staircases and arrive at a suspended balcony structure, supported by these columns. Space and time was then skewed as we took much longer to travel a seemingly long distance to the ground via several storeys of ramps. This felt rather more like a descent into a Theban royal tomb, with the promise of further discovery at the base. One lap was inevitably not enough, and by the end of our visit we had conquered this climbing frame four times. Next, through a curtain of material fronds, we discovered Li Xiaodong's incredible maze, created from wood poles with a brightly uplit floor. 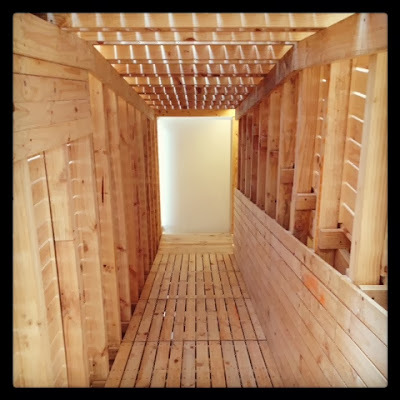 This space was womb-like, disorientating and full of surprises. The slatted walls offered tantalising glimpses of other spaces we could eventually reach (or perhaps had just left behind?) and we, at times, stumbled upon exciting wooden enclosed structures that were wendyhouse-like in character; producing squeals of delight and great opportunities for games of peek-a-boo. Finally we fell upon a large enclosed beach of pebbles, mirrored on several sides. What a stimulating space! Though I'm afraid the temptation to pick up and throw stones here rather than just touch them was a little too much to bear for our sensory explorers. Sadly our pals then had to go to meet the school run, but we continued our voyage of discovery to ensure we hadn't missed anything exciting. We were rewarded for retracing our steps as we stumbled upon two spaces perfect also for Culturetot (at two and a half months). 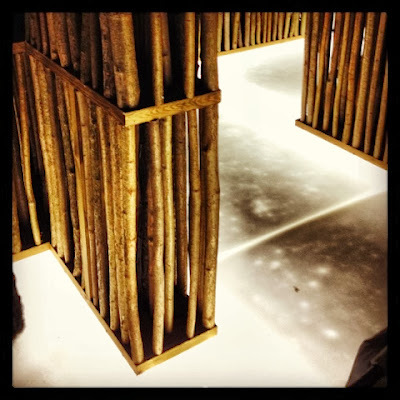 Kengo Kuma's dark rooms contained delicate structures of bamboo lit from the floor by white lights. As we moved round the rooms to reach new angles the patterns danced and morphed into new shapes. 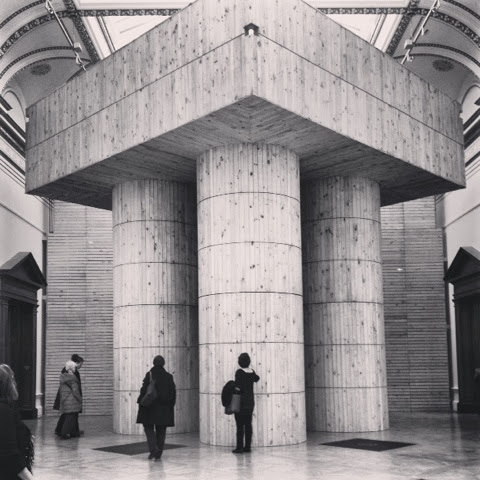 The installation felt rather like a shrine and the pilgrims took on a certain reverence, different to their handling of the rest of the exhibition. Here we too needed to be very careful and had to resist the temptation to enter into the delicate structure. Culturebaby inevitably rejected the idea of a nap and insisted on returning to all the areas she had enjoyed so much at least one more time before we left, which took nearly another hour. She clearly had a truly memorable experience and was able to recall and discuss certain elements on our journey home. I was pleased to see that the RA are putting on a few family events in the coming weeks (see here) and we may well be tempted to return. At £14 for an adult ticket (tots are free), this exhibition is a little pricey, but well worth it. Practically I was also a little nervous about the journey with a heavy double pram, but was delighted to discover that it was really easy. Green Park station is step free, and very close. If you have a little sensory explorer of your own at home, don't think twice. 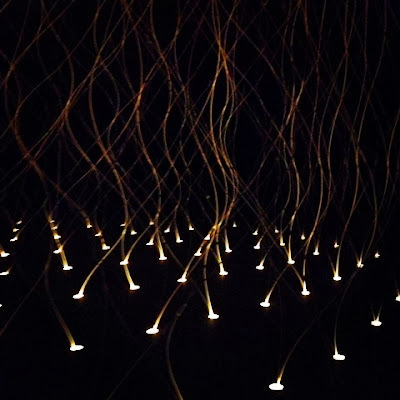 This was a truly brilliant experience for child and parent alike, and just like the fabulous Kusama exhibition in 2012, won't be around to enjoy forever - and nor will our little adsorbent minds. Our experience was very different. With a home educated 4, 7 and 9 year old. The security guards were very rude. Repeatedly. I know a few friends with toddlers who said it was okay but we felt really let down. Katie this is such a huge shame. I know people with older children who had a great experience. It just shows how much damage can be done to to a child's experience by grumpy guards. We have experienced this at the National Gallery. No damage possible to the art, but it changes the whole experience when you feel policed. Some serious training needed in some institutions. We had a brilliant experience and can't say that we even noticed any guards. In fact, what we loved the most was the opportunity for the children to be totally free to explore on their own terms and with complete freedom. They chose the direction, the length of time they spent in each exhibit and they well and truly explored art from inside and out. With three children between the ages of 3 and 7 most gallery visits inevitably result in us spending time looking at something that one of them is really interested in while the others get a little fed up waiting to go and see something that has caught their eye around the corner. Sensing spaces had them all engaged the entire time. In so many galleries, children are, quite rightly, unable to touch displays yet often exhibits look inviting to touch, whether its the bumpy relief of an ancient tomb, the soft silk of a beautiful dress or the smooth curves of a statue. 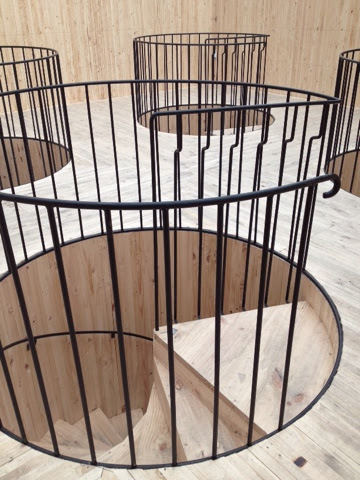 Sensing spaces challenged this and let them forgo the restraint. They were not only able to touch, they were actively encouraged to do so. 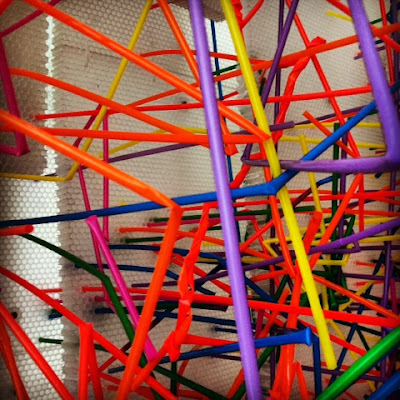 It is not every day that a child can be part of the exhibit building process, change what is before them and create something for themselves, to be displayed ready for the next gallery visitor to see and interpret. 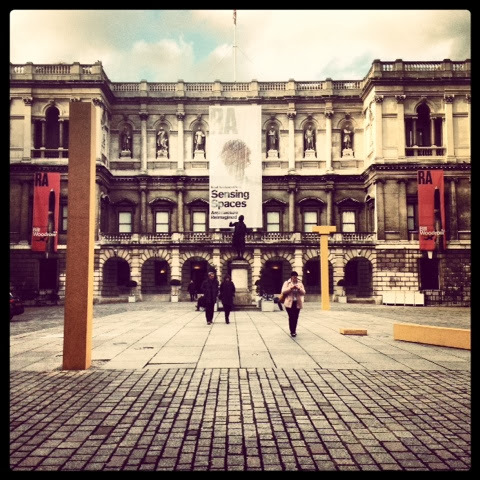 For that alone, this exhibition thrilled but it was a gem all round and we are all lamenting the exhibits closure. We wanted to go back.